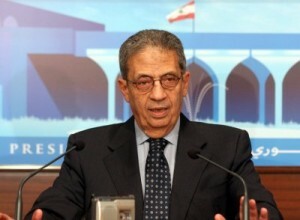 Moussa added that the level of Lebanon’s representation will depend on the internal Lebanese situation. “There is enough time to discuss the issue,” said Moussa. “Lebanon’s participation in the upcoming Arab Summit is necessary, since it is a non-permanent member of the UN Security Council,” he added. Moussa touched on the issue of the 1978 disappearance in Libya of Shiite leader Imam Moussa Sadr ( founder of the Amal movement ), saying that the issue, while very sensitive to some Lebanese, should not be discussed in the media. Amal Movement leader , Speaker Nabih Berri, called for boycotting the summit saying that Libya remains responsible for Sadr’s disappearance.